One of my financial goals for the year was to sit down and read a bit more, and so far, this goal has been going better than expected. 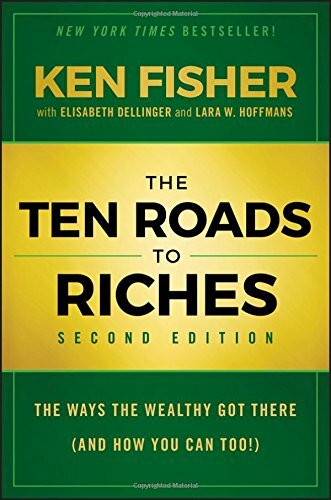 Recently, I was contacted by Ken Fishers PR team to help promote his latest book “The Ten Roads to Riches (second edition)”. I get a lot of PR book requests, but the title and author of this book really caught my attention. The author of the book is Ken Fisher, a billionaire investment analyst and founder of Fisher Investments – a firm that provides fee-only financial advisory services for high net worth individuals. Ken’s father, Philip Fisher was also well known and respected in the investment world. You may know Philip as the author of the popular investment book – Common Stocks and Uncommon Profits. With the impressive author aside, I found the topic of the book to be quite engaging and a bit of a twist as it’s written from the perspective of a billionaire. The book is mostly about how the super rich became super rich. Not just multi-millionaire wealthy, I’m talking billionaires who are in a league of their own. Build a Successful Business – This is essentially starting your own company and succeeding. The author gets into how to get into the mindset of growing your business and the necessity of having the mindset of either growing your business to sell or growing it for the long term. He notes that this is the most common way the super rich get super rich. Become a CEO – We all know about the extravagant pay that most CEOs receive and Ken Fisher believes that it’s not as hard as one may think to become one. He believes in starting with a smaller company and once you get the title of CEO to work your way up to larger companies. Be a Ride Along – This is an interesting concept of basically riding the coattails of really successful companies. The risk, of course, is that you essentially need to work for a small start-up and hope that it succeeds. I have a number of acquaintances that have done this to some degree of success. For more significant stories of this, look at Mark Zuckerberg’s followers from the early days, and check out their net worth. Become Famous – I didn’t read too much into this chapter, but it was about how some entertainers become super rich. For example, musicians and songwriters who get paid royalties every time their song is played on the radio. Marry Well – I found this chapter intriguing as I always knew that some people married into money, but didn’t really consider it a strategy. Ken goes into a bit of detail in this chapter and even recommends books that are dedicated to this topic. Steal It – This method is about litigation and how some people have built businesses around this schemish method of extracting money from companies. I will admit that I skimmed over this chapter without much interest. Others Peoples Money – This is how Ken Fisher built most of his net worth, but leveraging other people’s money. He explains the business model of fee-only financial planning and how it allows him to grow his business by 30% per year. This annual growth is driven by obtaining new clients and market performance. Essentially, his 1% fee equates to more and more revenues as the markets go up over the long term. Inventing Income – Do you have an interest in inventing a product and going to market? Ken goes into detail on how some inventors hit the jackpot. Real Estate – I remember reading about building wealth when I was in my teens and real estate always came up. That’s what got me initially interested in rental properties and rent-to-own strategies. Over time, that interest faded, but that’s not to take away from the strategy of owning real estate for the long term. Owning and investing in real estate is a proven long-term method of building wealth. Save and Invest – My favorite chapter of them all – likely because this blog is based around “saving and investing” as a method to grow wealth. Ken Fisher elaborates that this strategy may be the easiest method of getting wealthy. It may not lead to billions but could lead to tens of millions. I consider this method to be the absolute easiest and perhaps the best way to build wealth for regular working folk. I get into this strategy in detail here. Overall, the book was a quick and entertaining read. For his audience, I felt that he could have expanded on the “how everyone can get wealthy” chapter, which I found interesting coming from a billionaire. To summarize, if you want to make the Forbes list, you’ll need to do something big, like starting and growing a company (or companies) into something big. Otherwise, if you are ok with living a comfortable retirement without a private jet, then stick to the basic advice of saving and investing for the long term. At least that’s what I’m doing. I don’t have any aspiration to become a billionaire. It’s not that I don’t like being wealthy, it’s just that I am content with a $2M millionaire. I may not be setting the bar too high, but I think that I rather spend the time to enjoy my money after I reach my financial independent goals. Of the ten methods that Ken mentioned, I prefer to use Others Peoples Money to invest in Real Estate and Save and Invest my way to become a $2M Millionaire. Naturally #10 appeals to me the most. It’s the easiest and most common way for the average person to become rich. There’s relatively little risk to saving and investing (relative to the other methods Ken mentions). It can also lead to billions, if you’re a person like Warren Buffet. I used to be against using other people’s money as I considered it debt. Things are changing in my head and I’m looking into using more of opm’s. Previous post: Bumped from a Flight? Here’s How Much Compensation You Get!